You would like to reside in our comfortable villa with pool and breathtaking views to the sea?Lisbon and Sintra shall be closeby? Our villa at Praia do Guincho is just what you are looking for! You want “Malibu-feeling” in Europe with a boutique touch and the ocean within reach? Then our luxury villa situated front row at the coastline with breathtaking sea views is the right choice. You would like to do yoga & surfing in the warmth of the Algarve residing in our comfortable villa with pool in an adorable surrounding? 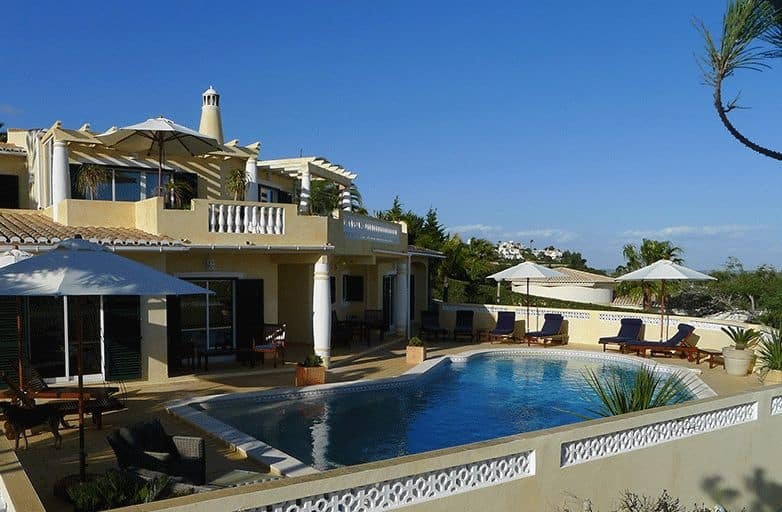 You need to book our beautiful Algarve villa! 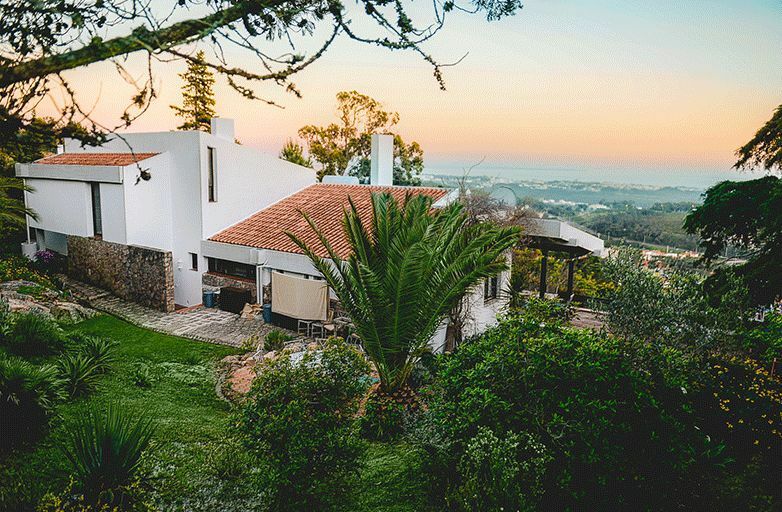 Comfortable villa with paradisiac garden and pool with breathtaking sea view situated on the slopes of Serra de Sintra close to Lisbon. 5 nice double rooms (some with balcony and sea view), 1 appartment, living and dining room with panoramic windows and fireplace, fully equipped kitchen, internet (wifi), big wooden deck terace, extra yoga room and many chillout areas and hammocks in the large garden. 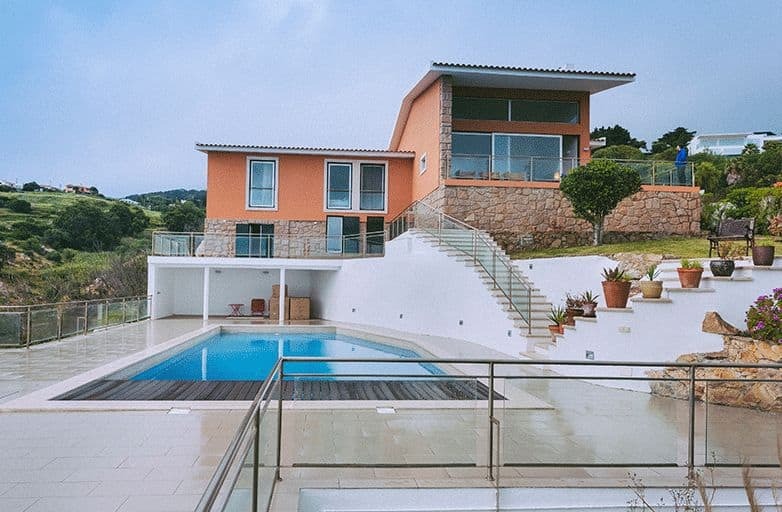 Luxurious boutique styled villa with great natural garden, wooden yoga deck, pool, sauna, and jacuzzi, directly at the coastline of Praia do Guincho with fascinating ocean view. 5 beautiful double rooms and 1 Apartment (all with sea view), 2 living rooms, fireplace, pool table, fully equipped kitchen, WLAN, big wooden yoga deck with breathtaking views, private climbing rock, as well as lots of cozy places to retreat and chill out. If you would like to explore the Algarve in Portugal’s warm south enjoying the Karma Surf Retreat spirit and comfort, our Villa in the southwest of the Algarve is the right choice for you: Comfortable villa in golf resort with pool and 5 double rooms, living and dining room, fireplace, fully equipped kitchen, internet (wifi), big terrace and chill out areas with hammocks in the nice mediterranean garden.